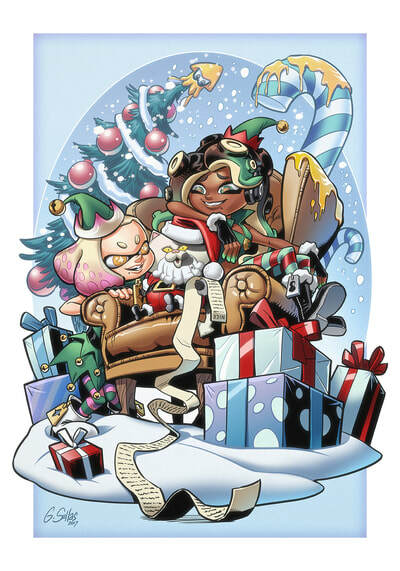 Celebrate Squidmas with a holiday themed Splatoon image! You can choose between a plain version with no text (shown above), or customize the image with your own holiday greeting. You can even use it as a Christmas card and send it out to all your Inkling friends! Digital download tiers (1 and 2) receive a large, high-res file. Print tiers (3 and 4) receive a 14x20 inch high quality print signed by the artist (that's me!) and shipped to anywhere in the world. Tier 1 - $10 - Plain Digital File Download - This is a high-res version of the image above, with no extra text. Tier 2 - $20 - Customized Digital File Download - This is a high-res version of the image above, with your custom text added to it. Tier 3 - $45 - USA ONLY Large Print - No extra text, just the image above in a 14x20 inch print hand signed by the artist. The digital file will also be sent to you. Tier 4 - $?? - International Large Print Personalized - INQUIRE WITH DESTINATION COUNTRY FOR A PRICE QUOTE. No extra text, just the image above in a 14x20 inch print hand signed by the artist. The digital file will also be sent to you. PAYPAL is the preferred payment method and orders will not be processed until your payment is received. You will receive payment instructions in the confirmation email that also confirms your order.